After giving a brief history of tillage practices and implements used throughout the world dating back to ancient times, this book goes on to describe the basic soil mechanics techniques needed to calculate the forces developed in soil by simple-shaped cutting tools. The methods of measuring soil mechanical properties, water pressure in soil and shear rate effects are touched upon. A review is given of two and three dimensional soil cutting mathematical mechanics models to predict soil cutting forces and soil volumes disturbed by cutting and tillage tools, as well as the state-of-the-art of soil loosening, structural rearrangement and plant growth as affected by tillage tools. The author also includes an introduction to the analysis of traction machines. There are many numerical examples of mechanical analyses and predictions worked out in the various sections of the book as well as numerous unsolved problems at the end of a number of the chapters. 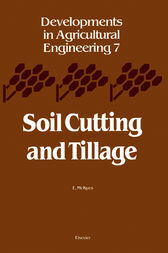 Written in a textbook style, this monograph is ideal for anyone wanting to learn modern techniques for the mechanical description of soil cutting and tillage forces and soil volumes disturbed. It also provides a reference for analytical formulae and calculated force forces. It will be of interest to universities and colleges worldwide which have Agricultural Engineering Programs, Civil and Mechanical Engineering schools which specialize in soil mechanics and construction machinery as well as to research stations worldwide with interests in soil tillage, soil physics etc. It is an extremely informative text exploring in some depth the theory and application of the universal earth moving equation as it applies to soil cutting and tillage. Those engaged in tillage research and tillage equipment will find this an invaluable text.